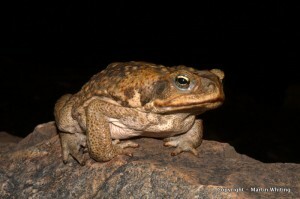 The cane toad (Rhinella marina) has been spreading rapidly across northern Australia since its introduction to control sugar cane beetles in 1935. While toads have been the focus of considerable research, we still have a poor understanding of how behavioiural traits vary across the range, particularly with respect to traits that enhance dispersal, such as boldness and exploratory behavior. One advantage of dispersing into new habitats is the availability of new resources and lowered competition. Cane toads from the vanguard of the ongoing Australian invasion were more exploratory and likely to take risks in novel arenas than were toads from long-colonised populations. Results from this research suggest that dispersal-enhancing behavioural traits may be important drivers of invasion success in cane toads. 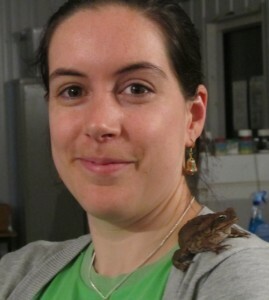 The research, carried out by PhD student Jodie Gruber under the supervision of Rick Shine, Greg Brown (University of Sydney), and the Lizard Lab’s Martin Whiting, has just been published in the journal Behavioural Ecology and Sociology. Gruber, J., Brown, G., Whiting, M. J., & Shine, R. (2017). Geographic divergence in dispersal-related behaviour in cane toads from range-front versus range-core populations in Australia. Behavioral Ecology and Sociobiology 71(2), 38. doi: 10.1007/s00265-017-2266-8. The infamous cane toad (Rhinella marina). Jodie and one of the participants in her study. Jodie in the toad room.